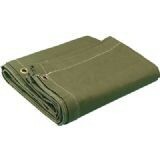 06' X 10' Heavy Duty Green Canvas Tarp - 10oz. Our extra-tough canvas tarps are water, mildew and rot resistant with a clear urethane coating and many times stronger than canvas with added tear, abrasion and puncture resistance. You'll always get first-quality fabric but colors may vary. Double-stitched seams and single-stitched hems. Protect many types of equipment outside and inside the ship, garage, warehouse and around the farm. Single-stitched hem reduces cut size 6in. for each dimension. Double-stitched center seam. Rust-resistant grommets with reinforcing patches along the sides and at corners. Canvas Tarpaulins protect or conceal equipment and supplies while eliminating condensation. Not recommended for car or boat covers. - 10oz. per Square Yrd. Tarpcoversales.com offering product quantity discounts for buying in volume.